Certain fruits, such as apples, seem to make their way into many salad recipes—yet blueberries are an often-overlooked salad addition that can add such a delicious flavor boost. In this super-simple salad, the blueberries are the perfect partner for mild cracked wheat and summer herbs. Pour boiling water over cracked wheat in a medium bowl. Stir well, cover, and allow the mixture to rest for an hour. If any water remains after one hour, drain it off. Meanwhile, in a small dry skillet, heat the nuts over medium heat, stirring constantly until lightly toasted. Set aside. 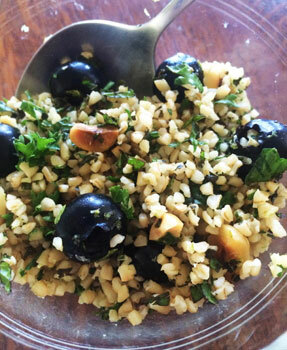 When they’re ready, toss with the soaked cracked wheat, olive oil, lime/lemon zest and juice, nuts, mint, parsley and blueberries. Serve at room temperature.